“That these defendants were willing to frame their critics to the point of giving false testimony under oath against them and having them arrested and indicted speaks legions for their disdain for the rule of law. Indeed, they arrogantly placed themselves above the law, meting out their personal brand of punishment to those ‘guilty’ of opposing their selfish aims. — Judge Richey in the sentencing of Mary Sue Hubbard and ten other Scientologists in October 1978 — US District Court, Washington DC. 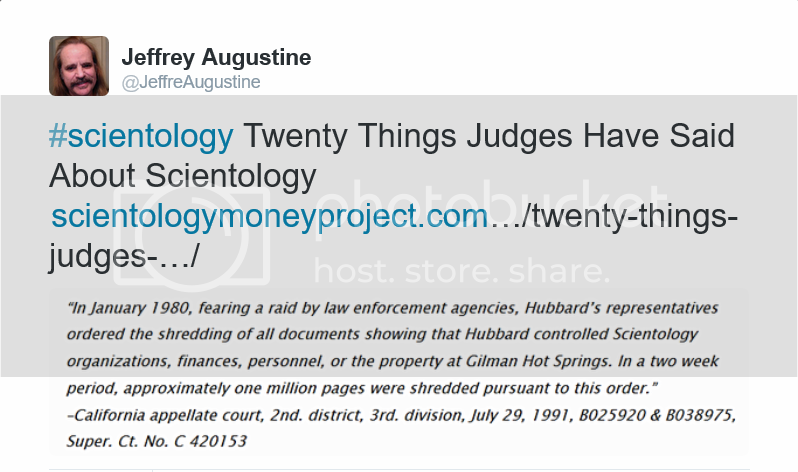 “The court concludes that a preponderance of the evidence demonstrates that CSI (Church of Scientology International) and its agents are primarily engaged in the business of selling or leasing goods or services.” — Judge Dib Waldrip in Rathbun v. Miscavige et. al. March 14, 2014. Not certain, but I believe these factual statements could be read into record as an opening statement for basis of fact against any law suit. David, glad you can use it. You should really be thanking Arnie Lerma as this is information he compiled and I reposted here. Arnie Lerma is a stand up guy who was fighting the Cult way back when it was really dangerous to do so. The Cult even got a search warrant from the US Gov’t and raided his house for OT materials. Arnie fought them in court at the cost of $1,000,000. Oooh this is great 🙂 I was just researching some judges statements to make impactful pics out of them. Glad to see this here! Some pretty serious statements.